If needed, appointments can be made to accommodate any conflicts with the scheduled hours. Please visit this link to renew your dog license online. *Please note, the license can only be renewed online if the rabies is current. -If a non-resident brings a dog into New York State for less than thirty (30) days and the dog is licensed according to the resident state's licensing laws. -Every licensed dog must have a certificate of rabies immunization issued by a licensed veterinarian. -License renewal forms will be mailed directly to the dog owner by the Town Clerk by the first day of the month that your license is due to expire. No individual resident may maintain more than four (4) dogs at a single address without complying with specific licensing regulations through the Town Clerk's Office. Every licensing town, city or village must have a Dog Control Officer (DCO) and municipal shelter services. Please see the 'Dog Control Officer' tab for Pomfret Dog Control Officers. Dog Control Officers are employed by both the Town of Pomfret and the Village of Fredonia. The DCO and shelter service enforces both State and any local dog laws and ordinances. Further, it is the DCO's responsibility to pick up lost and stray dogs and humanely care for them until they can be reunited with their owners or the specific time frame required by the New York State Department of Agriculture and Markets has been met, which ever comes first. Dogs are not released until they are properly immunized against rabies infection and all licensing and impound fees are paid. If your dog is lost or you find a lost dog, immediately contact your local DCO or shelter. Owners should seek lost unidentified dogs at the municipal shelter. The Pomfret/Fredonia shelter is the 'Fredonia Animal Hospital'. If a dog is lost but identified with a NYS identification tag, the DCO will contact the Town Clerk to trace the dog tag to the owner. The local dog control officer must institute action for violations of both state and local laws. Fines or civil penalties shall be up to $25 for the first offense, $50 for the second and $100 for the third and subsequent offenses. If a dog injure or kill livestock, the local assessor should be notified immediately. Do NOT destroy or bury the animals. They must be available for examination so the assessor can appraise the damage. 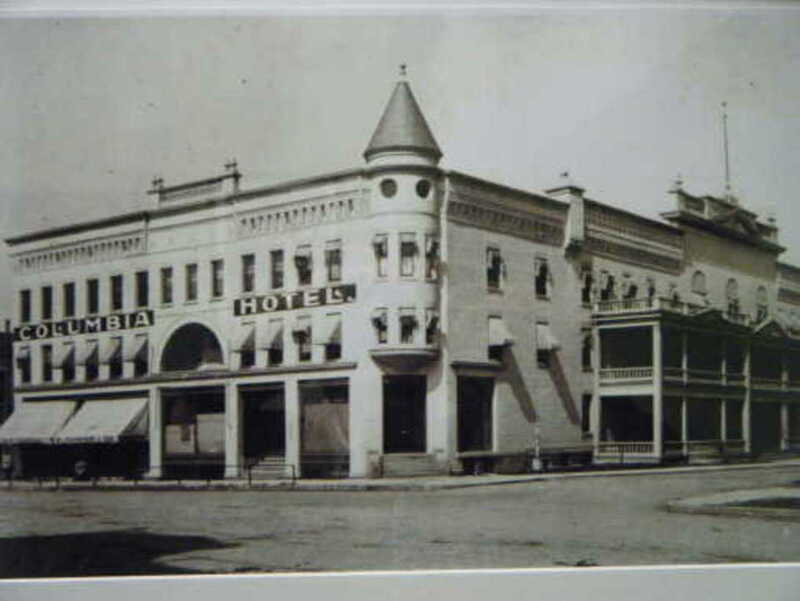 The Clerk, as Registrar of Vital Records, is responsible for issuing Birth Certificates in the Town exclusive of the Village of Fredonia, where this function is performed by the Village Clerk. Few births have been recorded in the Town since Brooks Memorial Hospital was constructed in the adjacent City of Dunkirk in 1898. Most births of Town of Pomfret residents are recorded in the Dunkirk City Clerk's office. 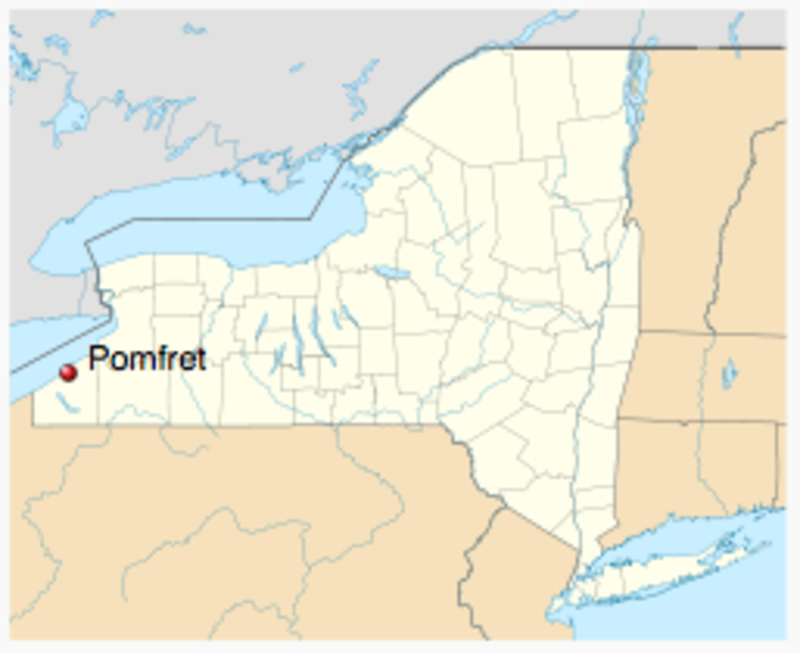 No hospitals currently exist in the Town of Pomfret. Any Town or City Clerk in New York State can issue Marriage Licenses for solemnization ceremonies in any location in New York State. Both the Bride and the Groom must appear before the Clerk. 1). Certified Birth Certificate OR a Passport must be presented to establish a date of birth. Divorce decrees or death certificates from all previous marriages of both partners must be presented. Marriage licenses must be requested at least twenty-four (24) hours before a marriage solemnization. A new license must be secured if more than sixty (60) days passes since the old license is secured. US or town citizenship is not a requirement for a marriage license in New York State. The fee is forty ($40) dollars, cash, check or credit card payments accepted. 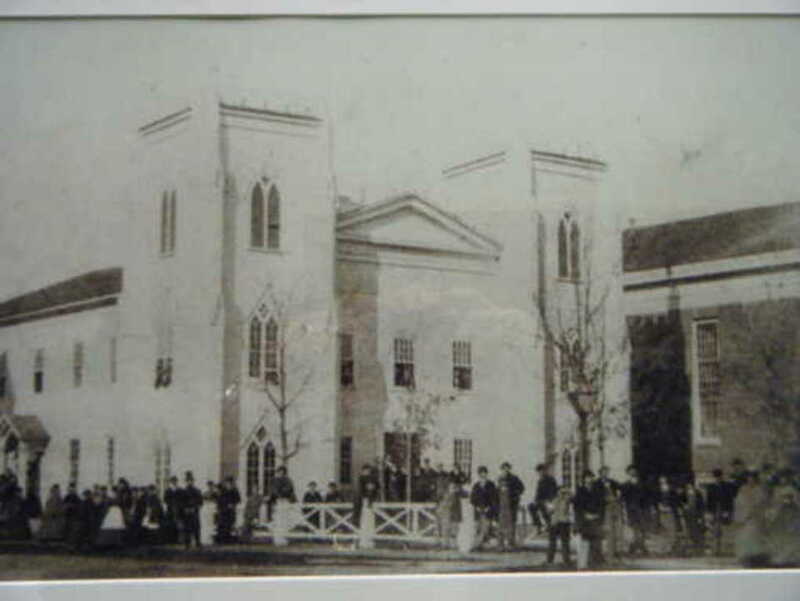 The Clerk issues Death Certificates describing individuals who pass within the Town of Pomfret exclusive of the Village of Fredonia, where this function is preformed by the Village Clerk. Most Death Certificates for residents of the Town of Pomfret are issued by the Dunkirk City Clerk, where Brooks Memorial Hospital is located. Newton Memorial Hospital, a County-operated tuberculosis and chronic diseases hospital, operated in the Town during the mid-twentieth century, and the Death Certificate archives include death records reported by that hospital. The Clerk issues Burial Transit Permits to morticians to permit legal movement of cadavers across the Town borders. 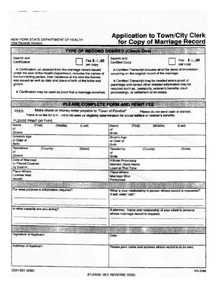 Download "Application to Town-City Clerk for Copy of Marriage Record.pdf"
Download "Application to Local Registrar for Copy of Death Record.pdf"
Download "Application to Local Registrar for Copy of Birth Record.pdf"
The Clerk is able to search the Town archives for birth, marriage, death, and tax assessment records. Generally fifty (50) years must have passed since marriage or death before genealogical copies can be issued. Seventy-five (75) years must have passed since birth before genealogical copies of birth certificates can be issued. 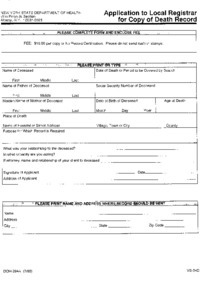 The individuals themselves or direct descendants can obtain copies before these dates as can individuals authorized by court order. for twenty-two (22) dollars each. 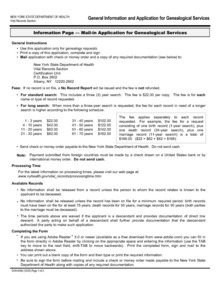 Download "General Information and Application for Genealogical Services.pdf"
Throughout the year, the Clerk issues hunting and fishing licenses of different classes for hunting and fishing throughout New York State. Both state residents and nonresidents are eligible for different classes of licenses. What identification or proof of residency will I need to purchase a license? 1. For hunting and trapping licenses, proof of a prior license or appropriate sportsman education certification. -A current pay stub or letter from a current employer on letterhead containing your legal address. The Clerk offers Deer Management Permits to licensed hunters for the Fall deer-hunting season offered through a state-operated computerized lottery system from mid-August through October 1st of each year. State Environmental Conservation Officers police New York State hunting and fishing. The Clerk issues both temporary and permanent- accessible parking permits upon physician completion of an application. Many physicians have these forms in their offices. 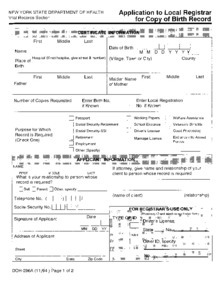 These forms can also be supplied by the Clerk. Applicants must appear in the Clerk's office with a driver's license. - Temporary-accessible parking permits are issued for six (6) months. They are not renewable. - Permanent-accessible parking permits are issued for three (3) years. They are renewable. - The applicant must reappear in the office to request subsequent permits. - No additional medical certification is required. - There is no charge for either class of accessible parking permits.